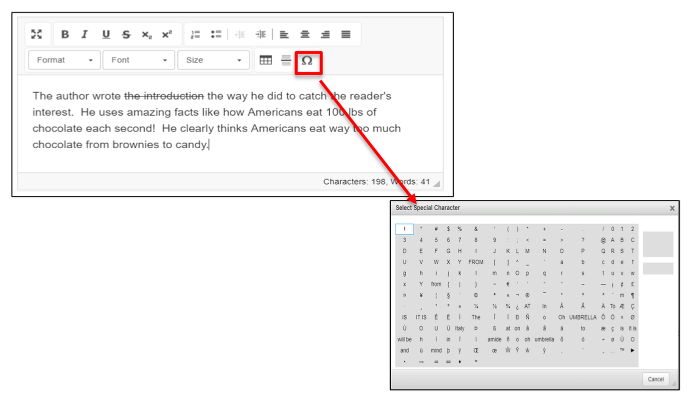 CKEditor formatting tools are available for students when answering a Constructed Response item in the Student Portal. For more information, please visit http://ckeditor.com/. A Constructed Response item requires the student to type an answer in the text box. Below is an explanation of each formatting icon. Enlarge textbox arrow: In the lower right hand corner, drag the arrow to enlarge the text box downward. Expand to full size: Click on this icon to expand the text to full page. Click again to go back to the original screen. Bold (B), Italics (I), and Underline (U): Highlight text and click on the desired icon. Strike-through: Highlight the desired text and click on this icon to strike through. To undo, highlight the text and click on the icon again. Subscript and Superscript: Highlight the text you want to format and click on the desired icon. Numbers or Bullets: Click on the desired function to add numbering or bullets. Unclick the icon to remove the formatting. Equation Editor: Click on the editor icon to create an equation. Insert a Table: Click on the Table icon and complete the Table Properties set up. Click OK to insert. Use the Backspace key to delete the table. Insert a Horizontal line: Click in the text to indicate where the line should be inserted, then click on the icon. Use the backspace key to remove the line. Insert Special Character: Click on the Omega symbol to insert special characters. To insert, click on the character, then click Close.